Did you know that the typical smart phone user checks their device up to 150 times per day? That’s 150 golden opportunities for you to engage with your audience. Hi, my name is Finola Lawlor and I’m from the Customer Success Team here at Pulsate. 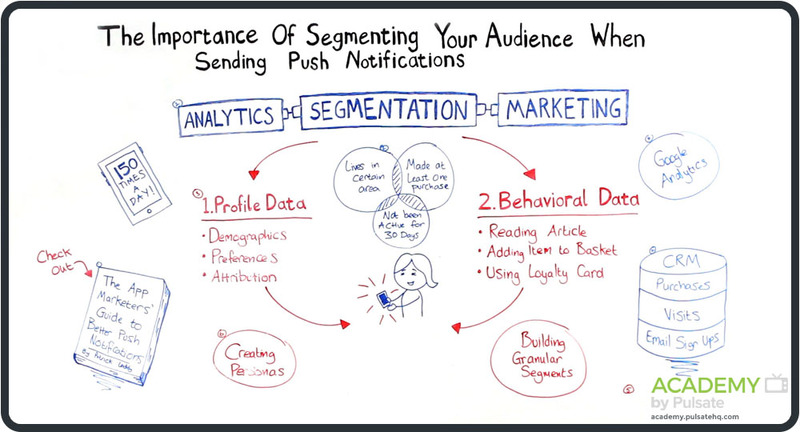 Today I’m going to tell you about the importance of sending the right push notification to the right user at the right time by using granular segmentation and personalization. So let’s get into it. So you may have already watched Patrick’s video on The App Marketer’s Guide to Sending Better Push Notifications. If you did, you’ll have learned about the seven points to consider when sending push notifications, such as the relevancy, sensitivity, and frequency. So the relevancy, this looks at who your audience are, who is going to be receiving those notifications, and are they relevant to them? The sensitivity, think of the time zone of the receiver and the time of the day that they’ll be receiving it. So if you’re a fitness app, there’s no point in sending a notification at 1 a.m. saying, “Let’s work out,” when the user is most likely going to be asleep. The third point was frequency. So frequency, although I said that we look at our devices 150 times per day, this obviously doesn’t mean that you would send this number of notifications out to your users. Think about how often your users are receiving your messages. You do not want to annoy them. So what is segmentation? Segmentation is basically making sense of your data. It is the link between your analytics and your marketing. So you could have segments built on users who live in a certain area, or made at least one in-app purchase, or have not been active in the app for 30 days. These are different ways that you can make up segments to be more granular with your targeting. So segments are built on two forms, profile data and behavioral data. Profile data is basically the characteristics of your users. So the demographics, this would be your age, gender, and location. The preferences and the attributions. So for the attribution, say you have a subscription level for your app. This could be the tier of subscription level that they are at. For behavioral data, this is basically how your users engage with your app. So whether they have read an article, or added an item to a basket, or used their loyalty card, this is all behavioral data that is gathered on your users. So how do you go about segmenting? And what tools do you use? There’s many different types of tools out there, such as Google Analytics. And there is also our platform, Pulsate, but we don’t need to talk about that here today. You may also have a database such as a SQL server or a MongoDB, where you have all this information stored. And you can write queries against this in order to segment your users that way. Whether you’re using a tool or using a raw database, it doesn’t matter. You just need to be narrow in your segmentation so you know who gets what. Okay. So event tracking is another way that you can segment your users. And event tracking is great if you don’t have a lot of data, if you’re just starting out. So what you can do is you can set events to different aspects of your app, so that if your user maybe looks at a certain item a number of times, an event is tracked against that each time so that they can then…if they don’t purchase that, then you can go and re-target that to then maybe when it goes on sale or another item has been added to the line that might be of interest to them. So that’s what event tracking is. Creating personas is also another good idea to do for segmenting your users. By creating a persona, you could have one, say, “Loyal Laura.” So when a user goes into a store and uses their loyalty card, you can send them a message later and say, “Thank you for using your loyalty card in the store today,” or, “Thank you for visiting in the store today.” And it helps this brand enthusiasm from your customers, brand loyalty, and it increases the app experience for your users. So that’s it from me here today with segmentation. If you have any questions, you can catch us @PulsateHQ on Twitter or leave a comment below under the video here. And be sure to subscribe to the Academy as well. See you next time.